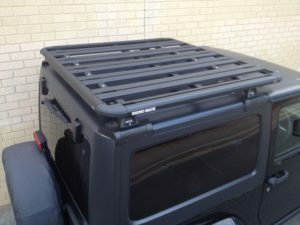 This Rhino-Rack Pioneer Platform is a sleek and stylish roof rack accessory for a range of JEEP JK Wranglers fitted with our Backbone system. 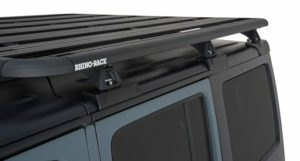 This Rhino-Rack Pioneer Platform is a sleek and stylish roof rack accessory for a range of JEEP JK Wranglers fitted with our Backbone system. Made with strong, durable and lightweight reinforced nylon and aluminium, these non-corrosive Pioneer Platforms have been tested to approx 90kgs carrying capacity. Carry more on your JEEP JK Wrangler with this Vortex 3 Bar Backbone System. 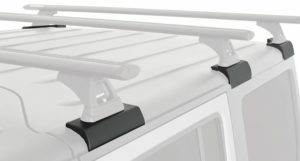 Rated up to 120kg which is approx 3 x more than other roof rack systems available on the market. Reinforced with interior steel structure. A classic roof rack for cars with rain gutters.